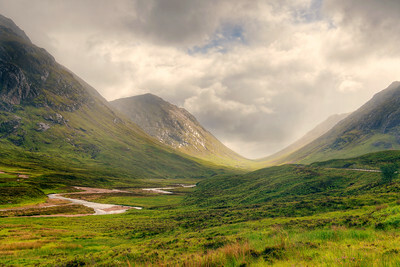 I loved the way the light lit up this u-shaped valley, otherwise known as Lairg Gratin in Buachaille Etiv Beag. It was definitely worth pulling over and setting up for. Glencoe, 2016. 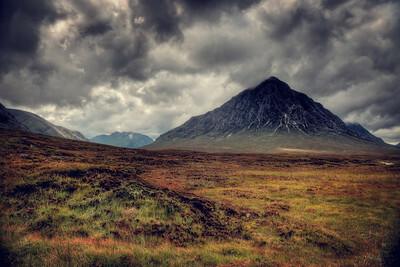 A darker and moodier view of Bauchaille Etiv Mor, looking out across a rather ominous looking moorland. 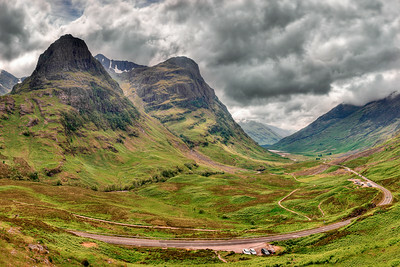 South of Glencoe, 2013. I got my feet wet talking this shot, and I was mightily concerned about slipping on the wet rock and injuring either myself or my camera. 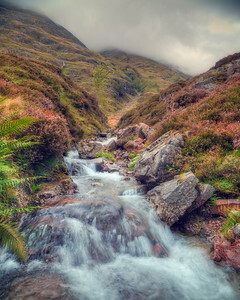 North of the River Coe adjacent to Aonach Dubh, 2013. I've seen this site with barely a trickle of water, so I feel quite lucky that I've also managed several times to see it with such a raging torrent. 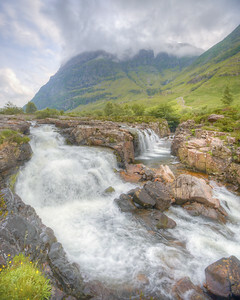 This is the Falls of Glencoe, 2013. I was treated to a real torrent of water at this River Coe site. It was actually mildly dangerous making my way down the slipper rock slope to get this shot, but it was certainly worth the effort given the way the low clouds sat at Bidean Nam Bian. 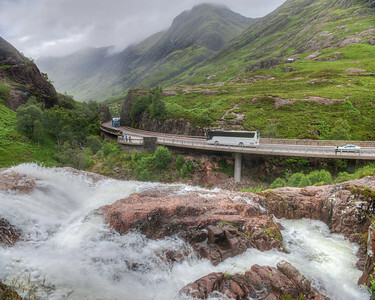 Glencoe, Scotland, 2015. 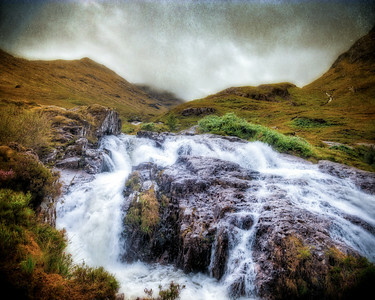 I've seen the Falls of Glencoe in full torrent and also with just a trickle of water - this was one of the good days. It's not easy to get up to this vantage point; you really do have to have sure footing. Scotland, 2016. 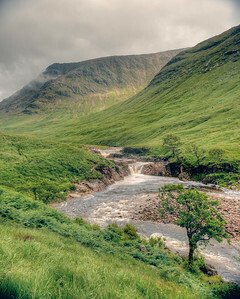 This is the River Etiv, south of Glencoe, 2016. It may be better known as one of the locations for the filming of the James Bond skyfall movie. 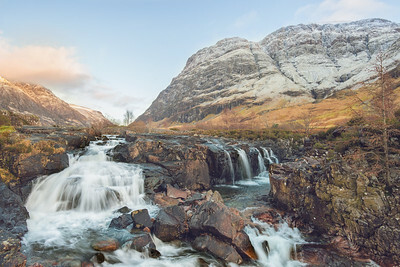 I personally wouldn't recognize it myself, but i was assured by my partner in crime that day, knowing that the film was definitely shot in the Glencoe vicinity. 2016. 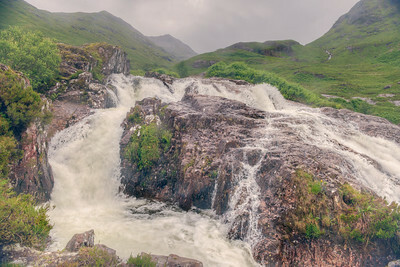 This is one of my earlier Bauchaille Etiv Mor shots, and this time I did get a nice flow of water along the river, even if it was at the height of summer in Glencoe, Scotland, 2016. 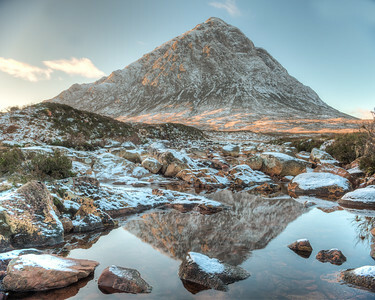 Another winter view of Glencoe, this time the River Coe and Bidean Nam Bian, complete with some snow. Actually, more like ice and the "snowmelt" was still to really take hold, hence the lower flows in the river. 2017. 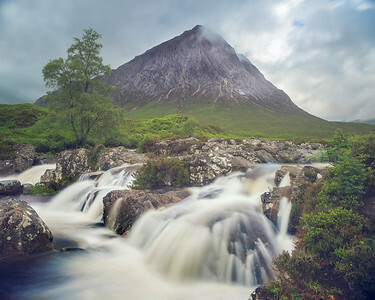 I've often wanted to get to Buachaille Etiv Mor in the winter to get a long exposure of the river here. The light was fantastic, but the snow melt simply wasn't there yet, which mean that all we got of this Glencoe view was a trickle of water. Scotland, 2017. 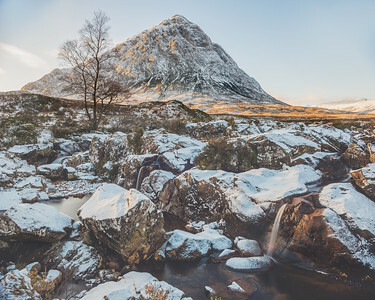 There was very little snowmelt in this Bauchaille Etiv Mor shot, so the flow of water wasn't really what I had dreamt of all those years of dreaming about a winter trip to Glencoe. The light, though, was magnificent. 2017. 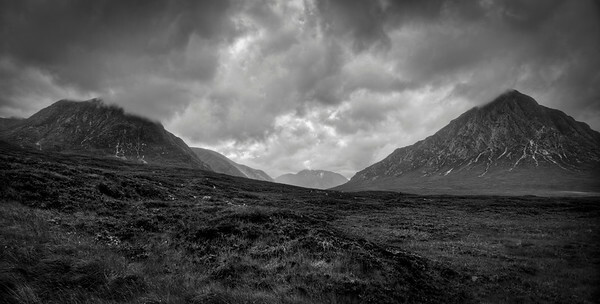 A moody looking scene on the moor next to Buachaille Etiv Mor, the dominating peak at the bottom end of Glencoe, Scotland, 2013.